Concerning the shell the SDS1 pad reminds me of an SDS8 pad. But it contains its own digital sound generation whose core is a 64 or 128kBit eprom which could be used inside an SDS7 as well. Only the filters were reduced to pitch and pitch bend. An additional feature was the so called run generator which detected a drum roll as such and reacted with a modulation of the pitch just like the drummer playing a roll over a huge amount of toms with increasing diameter. An extra trigger input made it possible to trigger the SDS1 with anything that was able to produce an electric impulse. The SDS1 could be run by an external power supply as well as standard batteries. The audio output was a 6.3mm jack. 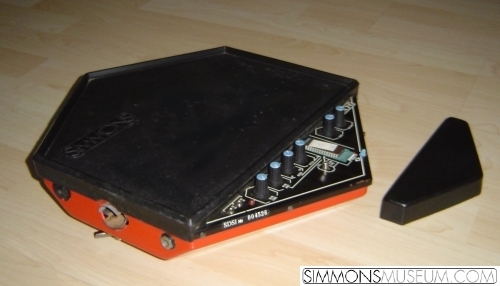 The pad was mounted by the use of a standard Pearl compatible tom arm like all Simmons pads. All in all the SDS1 was a cheap alternative for those who wanted to have access to the digital SDS7 sound library.